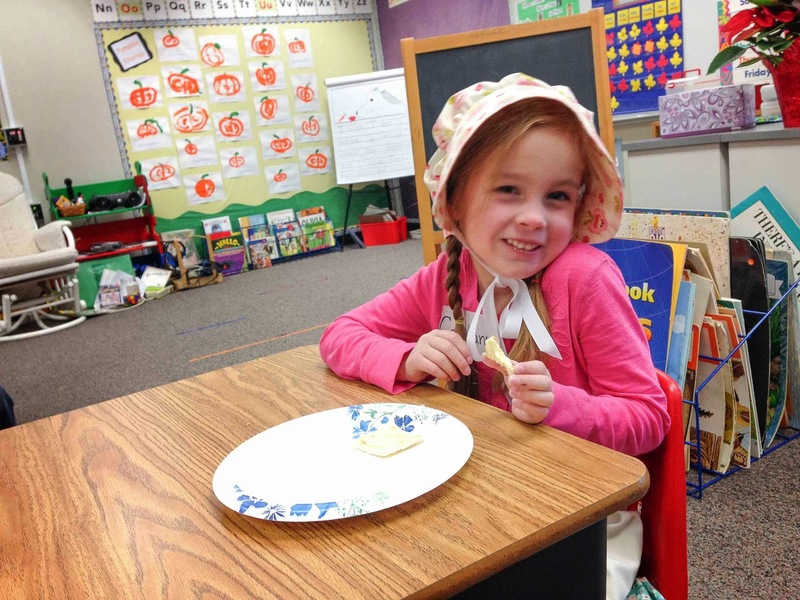 For the past couple weeks my daughter's kindergarten class has been learning about "old timey" things. We got a note earlier this week saying that Friday would be Old Fashioned Day and the kids could dress in old fashioned clothing. Of course Harper's closet is full of skinny jeans and glitter and nothing she owns even relatively resembles something old fashioned. Even though this was an optional activity, I thought it would be fun if we picked out some fabrics and made her something to wear. Good thing that old fashioned clothes are pretty simple to make because I was totally winging it. The entire project took about 90 minutes and I am not a quick sewer, especially when it comes to clothes, so this was really easy (I did not make the shirt). Can you tell she was super excited to have her picture taken? But she was excited to wear her clothes. She chose this Alexander Henry cherry blossom print for the skirt. We didn't quite have enough so we added a hot pink strip to the bottom to make it extra old fashioned looking (ha ha). So we didn't keep with a historically accurate color scheme but I wanted to make her something she would actually want to wear. We made her apron out of Kona bone and her bonnet is an older print from a line called Hunky Dory that is actually leftover from the very first quilt I ever made. I got to stay and volunteer in Harper's class this morning and we got to do some weaving, we made some butter, and got to play some old fashioned games. Her teacher even gave each kid an old fashioned name (Harper's was "Constance"). This ended up being a great quick project because I sliced my thumb open pretty severely earlier this week and it turns out that I need 2 opposable thumbs to work on anything more complicated. That's what I get for trying to cook! It turned out so cute! She looks pretty delighted with the outfit, so that's definitely a win! So cute! She looks like a timid old-fashioned girl who is not used to having her picture taken. :) At least in the first photo! Hope your thumb recovers quickly - at first I was thinking it was a rotary cutter injury! The whole outfit is adorable! 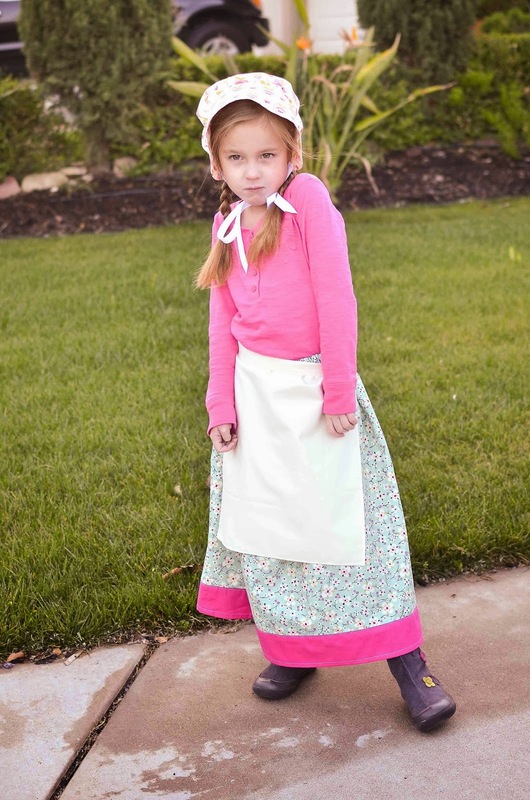 The boots, hair braids, and shirt go perfect with your sewing. You did fantastic job! I remember making butter in old mason jars when I was in elementary school. It was 4th grade and we had just finished reading Little House in the Big Woods. I loved that activity. What a fun class day. Creative teacher and creative mama! Ouch! for your thumb...can't tell you how many times I have done that! The Old Timey costume is darling. 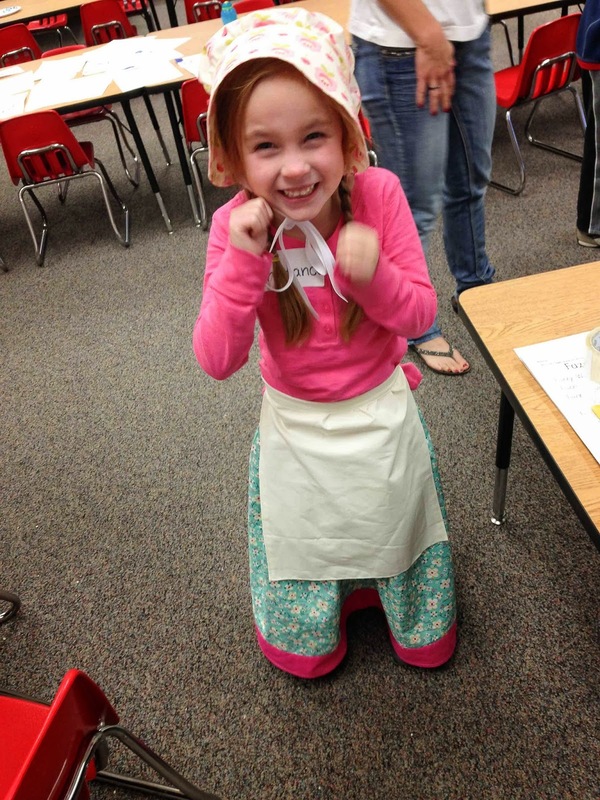 Such a cute outfit, and the whole "old timey" day sounds pretty fun actually! Oh no, your poor thumb! I hope it heals up real quick - were you attacked by a rotary cutter?